BEIT OMAR, Palestine — The Run Across Palestine had gone no more than 10 kilometers between At-Tuwani and Beit Omar, in the southern West Bank, when the Israeli military and border control stopped the run in its tracks. Confusion over whether the runners had the right to walk on the side of the road culminated in the arrest of Run Across Palestine supporter Nasser Abufarha and two French activists. No reason was given for the arrests, and no reason was given for why the run was stopped. The Run Across Palestine is a project of Michigan-based On the Ground to support Palestinian fair-trade olive farmers. The Run is scheduled to complete 129 miles over five days, between the Hebron Hills in the southern West Bank and Jenin in the north. The runners are staying in olive farming communities along the way. The initial delegation of 10 Americans, including six runners, three journalists and one musician arrived in At-Tuwani yesterday to a joyous community celebration that included planting olive trees, speeches, theater presentations, live music and dancing. Palestinians, French and other foreign nationals joined the run today. Almost immediately after leaving At-Tuwani, a Palestinian village next to two Israeli settlements that are deemed illegal according to the United Nations, Israeli soldiers stopped and questioned the runners. It quickly became clear to the runners that the authorities didn’t have laws opposed to, or a policy relating to, foreigners running along public highways. Nevertheless, the runners were told that if a single participant touched the pavement, Abufarha, a Palestinian-U.S. dual citizen, would be arrested. No more than 2 kilometers later, at the top of a hill overlooking the West Bank’s vast olive groves, Israeli military and border control vehicles stopped the Americans, French and Palestinians again, though they had not stepped on the pavement. Reinforcements arrived, increasing the police force to approximately 15. The Americans’ passports were temporarily confiscated, Abufarha was arrested and driven away by the police, and calls were made to the Palestine Solidarity Network in Beit Omar to bring the passports of the three French citizens. 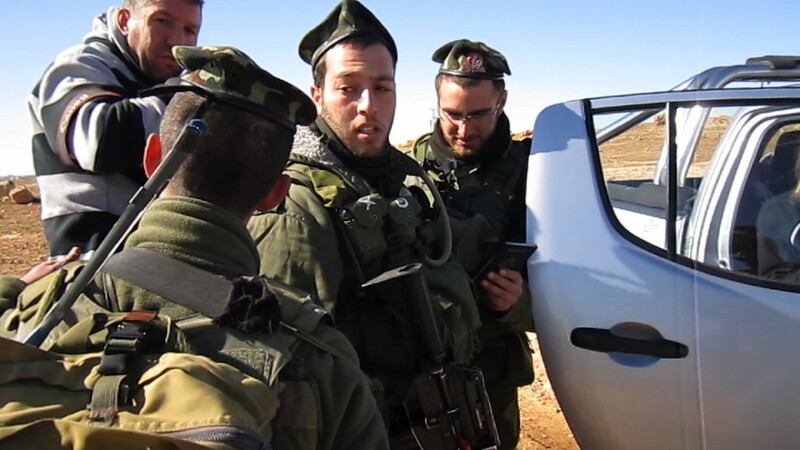 Two of the passports were located, but the Israeli soldiers grew impatient when the third couldn’t be found, and arrested two of the French activists, Florian and Tomas, who locked arms while lying on the ground and were forcibly dragged into a police vehicle. Immediately after the French citizens were driven away, the third passport was located. Abufarha and the French activists were all released later in the day. Abufarha was charged by the Israelis with “ordering an illegal demonstration and march” even though he didn’t organize the run, which wasn’t political in nature. Reuters photographers and videographers, Run Across Palestine’s media team and a smattering of other journalists documented the entire scene, which took place over two hours. Shortly after the Israeli military left, the runners took busses up the road, and then resumed their run. Last year, for example, On the Ground organized the Run Across Ethiopia, which featured 10 U.S. runners logging 250 miles over 10 days to raise money for, and awareness surrounding, fair-trade coffee farmers in Yirgachefe. The event raised approximately $200,000 to build three schools in the impoverished rural region. That run, in January 2010, was without incident, and featured hundreds of Ethiopian farmers and children running together with the American ultra-marathoners. Not so in the Holy Land. The Run Across Palestine is a complement to the Run Across Ethiopia. In the politically volatile West Bank, 45 percent of arable land is devoted to growing olive trees, employing some 100,000 Palestinian farmers. Hundreds of thousands of olive trees have been uprooted in recent years by the Israeli military and Israeli settlers. Videos of the arrests to come soon. Follow news from the Run Across Palestine at www.RunAcrossPalestine.org.